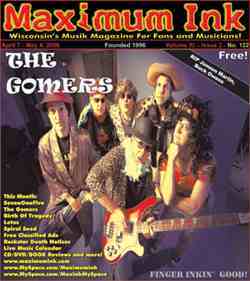 The Gomers Part Two was established as a Comedy Sportz band around 1988, which prompted them to learn a gi-normous amount of cover tunes, as well as beginning their, according to Biff, “bizarre and creative” musical exploration, often being compared to Zappa. The period included shows with national acts like Mojo Nixon and Molly Hatchet, as well as Wisconsin greats like Poopshovel and Couch Flambeau. Rock Star Gomeroke, now a weekly staple of the Madison music scene, is live band karaoke every Tuesday night at The High Noon Saloon, playing from a setlist of thousands of songs. The current Gomers lineup is “eight dudes strong” and, to give you some idea of their enormous range, they recently played the entire “In the Jungle Groove” album by James Brown with Madison’s legendary funky drummer Clyde Stubblefield, and later in the evening offered a full presentation of Talking Heads’ “Remain in Light.” On April 22, they’ll be performing Led Zeppelin II in its entirety at the Maximum Ink’s Ten Year Anniversary Party at the Annex..